Eden Elements is one of the residential development of Eden Group, located in Kalikapur, Kolkata. It offers spacious and skillfully designed 2BHK and 3BHK apartments. The project is well equipped with all modern amenities and 24 x 7 security service to facilitate the needs of the residents. Kalikapur is located in the Haltu district of Kolkata. Kalikapur Santoshpur link road runs through the region. It is a strategically designed locality that offers all types of properties ranging from gated community to highend apartments. Based on the east shore of Hooghly River, Kolkata defines culture and festivities. It is the main financial and commercial hub of NorthEast India. The strong transport network and ferrous infrastructure have listed Kolkata in top Indian city in terms of the wellplanned public transportation network. From residential apartment to luxury homes, Kolkata offers a variety of option to the homebuyer. The property rates in Kolkata is much lower in comparison to other metropolitan cities of the nation. The city has received positive sentiments in demand of real estate. What is the project location?The project is located at Kalikapur, Kolkata South. What is the area of apartments in Eden Elements? The area of apartments offered in the project ranges from 843.0 sqft to 1698.0 sqft. 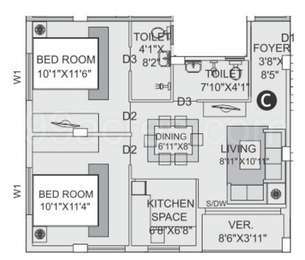 What is the area of 2 bhk in Eden Elements? The size of a 2BHK unit in the project ranges from 843.0 sqft to 1134.0 sqft. What is size of 3 bhk in Eden Elements? 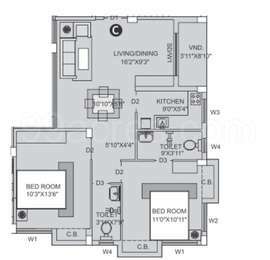 The area of 3 BHK apartments ranges from 1169.0 sqft to 1698.0 sqft. What is price of 2 bhk in Eden Elements? 2 BHK apartments in the project are available at a price of Rs. 5431200 to Rs. 6534800. How much is price of 3bhk in Eden Elements? The price of 3 BHK units in the project is Rs. 7824400. What is the price sq.ft for Eden Element? Also, what is the size of 2 BHK and 3 BHK?